What makes a cloth suitable for a jacket, but not for a suit? This is a question I know many readers struggle with, particularly as offices become more casual. Without the safety of a dark suit and dark shoes, what should a man wear? Why doesn’t the jacket from that suit just work with other trousers? The key is the density of the cloth. A fine worsted wool used for suiting is quite dense, with more yarn per centimetre. This is controlled by the ‘set’ of the loom when the cloth is woven. A denser cloth is better ‘constructed’, as those in the cloth industry put it. It has more body, and thus can hang and drape better, as well as retaining a crease in a pair of trousers. Jacketings (cloths used for jackets) tend to be looser in the weave and therefore more malleable. If you pick up a nice navy cashmere jacketing, it will feel spongy and pliable. A navy suiting, by contrast, will feel like it has a definite shape and direction. It knows where it wants to go, and once you’ve stopped messing around with it, it will return there. A jacketing is often thought of as soft, but it doesn’t have to be. A navy cashmere and a hairy Shetland are very different in feel, but they both have this loose, pliable feel in common. 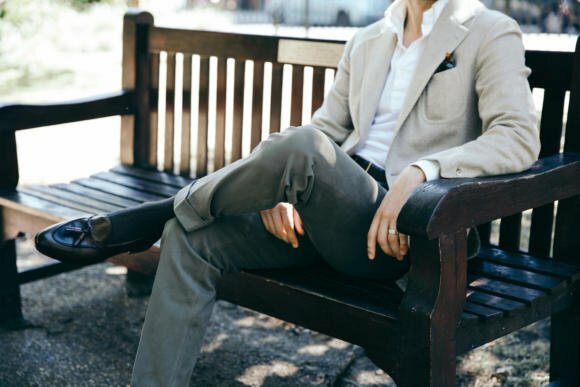 But even if summer jacket is in plain linen, it will usually be a lighter weight if intended for a jacketing and heavier if for a whole suit – with that weight partly down to how densely it has been woven. Now, this doesn’t mean the weaver can make anything into a suiting, as long as the set is right. For something to work as a suiting, it also has to be a relatively long fiber, so it can be spun into a fine yarn. The vast majority of cashmere fibers are just too short, as are Shetland and Harris wools. It is possible to make suitings out of cashmere, but the fibers have to be particularly long and carefully selected. You can have densely woven tweeds that are made into shooting suits, for example. But they have to be much heavier and will never have the fineness of a worsted suiting. A tweed like Saxony, meanwhile, uses a finer yarn than Shetland and is still heavier than most suitings. You could be forgiven for thinking that finishing was a more important factor than density. After all, it is finishing that makes something smooth or rough, sleek or fluffy. Most jackets do tend to have less of a finish than suits. They are not so ‘clean cut’, with the fibers being left a little longer. But you can also get jackets with a clean, shiny finish. It’s not my taste, but these can be seen as more formal jackets, and they are set apart from suits both by the ‘set’ and by their colour or pattern. One obvious exception to this is some forms of navy blazer. They are often made from a more densely woven cloth, more similar to a suiting. This is a question of formality, and is largely a hangover from days when a separate jacket and trousers was still very formal – before the lounge suit began to dominate all smart and professional menswear. Today, a navy blazer is usually a little less dense. Hopsack, for example, is a style of weave that is often used for a slightly less densely constructed jacket, and makes a more versatile, modern blazer. It also tends to have a less shiny finish. Finally, the colour and pattern of a jacketing usually sets it apart from a suit – although this is far more a question of culture and taste. Strong colours and bold patterns tend to be used in jackets just because having them in a whole suit would be overwhelming. It wouldn’t be smart enough, and therefore undermine most of what people want out of a suit. If you’re wearing a separate jacket and trousers, it works best where the two are clearly distinguished from each other. This can be done in lots of ways (texture, density, material, colour, pattern) but colour and pattern are the easiest. And patterned jackets generally work better than patterned trousers. As to what styles of jacket and trouser you should combine together, this is perhaps harder and certainly more subjective than what cloth should be used as a jacketing. 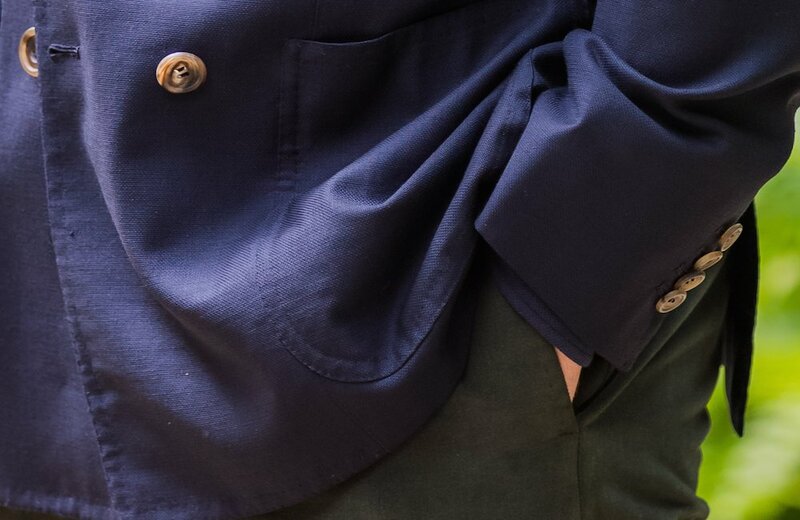 1 Navy is the most versatile colour for a jacket, followed by grey and pale browns (sand/oatmeal). It very rarely works as an odd trouser. 2 Green and brown are great jacket colours, but tend to be more rustic and casual. Get them in muted colours if possible. 3 Jeans only work with the most casual of jackets. Think texture, casual colour and a loose set! 5 Contrast is key. And white or cream are very useful in a trouser if you can get away with them. You can follow the discussion on The guide to jacketings by entering your email address in the box below. You will then receive an email every time a new comment is added. These will also contain a link to a page where you can stop the alerts, and remove all of your related data from the site. Surprisingly enough, this post comes out at the right time to me! In the past few days, I’ve been looking for sound advice to settle two issues. 1. Combining a navy blazer and charcoal trousers: If charcoal is the “fallback option for formal trouser-separates” as you once wrote, how really useful is such a combination. Assuming a navy blazer is the most formal odd jacket. 2. What about odd tweed trousers? Could they be easily combined with a navy blazer? 3. How useful are patterned tweed trousers? As you guess, my questions are focused on Winter-wardrobe challenges. On the first question, I guess it depends how often you dress that formally. But a mid-grey will be more useful and versatile, if that’s what you’re looking for, particularly in flannel. Hi Simon, you mentioned that navy rarely works with as an odd trouser color. How about with a blue plaid jacket? Terrific blog thank you Simon, and terrific advice. I beg to differ on one point ‘though: in your ‘tips’, surely blues-other-than-navy are more versatile than greys for odd jackets, given that, as you acknowledge, grey is the most versatile odd trouser. Unless they’re patterned, grey sports coats are a PITA to contrast. More generally, a useful rule of thumb I find is ‘Not all suits are worsted, but if it’s worsted it’s a suit’. Don’t even think about wearing it odd, up or down. Kudos to you for coming up with so many great discussion points. Thanks, and it’s certainly close on the greys or other blues. Worsted yarn can be used often on trousers, though I’m with you on the jackets. I have been collecting quality shoes for a couple of years now, ranging from Loake to Saint Crispin´s. This again, has made me more interested in clothes. So now I am going to buy a couple of jackets and trousers. I don´t want it to be too formal, this will not fit mye upcoming job as a teacher. Therefore I am considering tweed fabrics for jackets and flanell for trousers. Other suggestions are appreciated as well. To start off I wander what colours you recommend starting with, when it comes to flanell trousers and jackets? What other fabric than tweed would you recommend for less formal jackets? Any specific manufacturers of tweed you recommend? grams etc. There is a lot of information around the site – I suggest you start there if you don’t mind. After looking through different posts I have realized that I should get mid grey flannel first time off. When it comes to jackets, I am not quite clear on alternatives to tweed in the manner of same formality? If you are going to start with grey for your odd coat, look carefully at herringbone as a logical starting point, perhaps with leather buttons. Could a case be made for a patterned trousers? For a change of pace from plain trousers, what kind of cloth with a subtle pattern – anything but showy – while being warm enough for Winter could you then recommend? Keep in mind that it should be suitable to a blazer. Surprisinly enough – to me at least, I haven’t found a single piece of opinion worth mentionning on this topic. Being less versatile were a good reason? Great post Simon. I think you can have more fun with a sport coat then a suit, in pattern and coulor. Thanks Dimitrios. I think a separate piece on knitwear under jackets could be good. But briefly, a V-neck could be good under an SB jacket but less so under a DB generally. And a light grey jacket could go with loads of sweater colours – navy, dark green, burgundy, even charcoal. Trousers will be the harder area, as we’ve discussed before. A sweater under a DB would need to be turtle or roll neck to work. Not for me Nick, but good to have your view. Actually quite a classic look, but not current. Whats your views/personal experience on multiple trousers (2) for a single jacket framed I suppose more towards a business context where such item gets repetitive multiple use per week. Obviously for those who own 5, 6 bespoke suits a full rotation can be performed each day of a week, but in reality for those with a fewer number of bespoke – do you recommend multiple trousers to rotate with the jacket? I do, yes, even with 5 suits. Another good addition to the range of PS guides. One challenge when selecting cloth for suiting or jackets is will it look good on. Will the colour flatter or hinder (some colours do not work on everyone), also will the pattern or shade compliment your current wardrobe – will it match the range of trousers you might have in cut, colour and cloth. This is one of the key issues with bespoke vs. RTW – trying on a RTW jacket gives a ready impression as to suitability of cloth and colour. It is only through purchasing experience that one learns whether checks or tweed, green or tan, worsted or flannel really works. I think it best to learn this through RTW then apply the lessons to bespoke. I have a vintage donegal tweed suit, and it’s lightweight for a tweed. I usually just wear the jacket alone without the trousers and I feel it’s the type of suit jacket that works just fine as an odd jacket because of the rough texture. I’d also describe the weave as loose. But I don’t see a problem with the trousers. 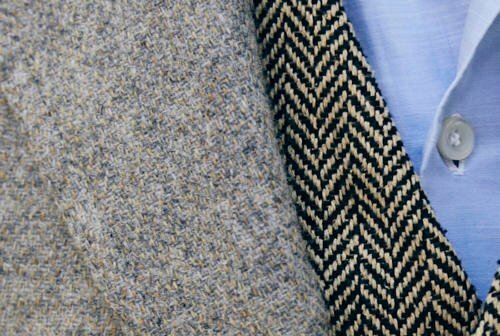 Is there a reason why this lightweight tweed works as a suit whilst most don’t? Is this an exception? Hard to say without seeing it Matt, but the set is only the most important of several things – yarn, weave pattern, finish etc can all make the material stiffer and better for trousers. Perhaps it’s a worsted tweed? Is there such a thing as a Donegal worsted tweed? I thought the only tweed which blended with worsted wool was Saxony. Thanks Simon. It shows one is never too old to learn. I was not aware that such a Saxony/Donegal crossover existed. Can you direct me to a supplier as I would like to learn more. Regards. OK, thanks anyway. Have a good weekend. I don’t believe that it is worsted because it’s quite rough. I believe Donegal tweeds most commonly refer to a wool cloth combining yarns with the traditional coloured flecks or “nepps” which are spun in Ireland with a plain weave construction. The yarns used in different cloths may vary in count (weight/thickness) so it is possible your Donegal tweed is woven with a finer count than is often used for other Donegal or other tweeds. Saxony is the term used for woollen cloth where the wool is of a finer antipodean quality (referring to the Saxon Merino) and in comparison to the local Cheviot-style tweeds, whereas worsted wool of antipodean origin is often referred to as Botany wool. There is a spinner who produces genuine Donegal yarn using merino wool so I assume you could refer to a tweed of this yarn as a Saxony Donegal Tweed. I found this whole Saxony/Donegal thing quite interesting, so I have had a bit of a dig into my archives and cannot find a single reference where the two styles are linked. What comes over clearly, irrespective of provenance, is that the cloths are totally different from one another, with Donegal typically being quite coarse and thick, and Saxony being typically being lighter and softer. There are no references either to Donegal being woven with worsted wools, while this may be found in cloth woven in a Saxony style. I have 2 fabrics to be made into suits. Both are Worsted 100% Merino Wool, one is 6-7oz and the other 7-8oz. Are these suitable for just spring/summer or could the 7-8oz be worn most of the year? Is an 11/12oz tweed jacket suitable for the UK autumn / winter? Also, would this weight be ok with jeans / chinos? Or better suited to dressier trousers? The cloth I’ve ordered is green Donegal weighing 11.5 oz. I’m having it made up in the Neapolitan style. I’m guessing this should work with jeans. Would I be correct in assuming a darkish green Donegal is not something to wear in summer? Thanks in advance. Does green Donegal work with jeans? What cloth would you recommend for a (NYC) winter-weight navy blazer? 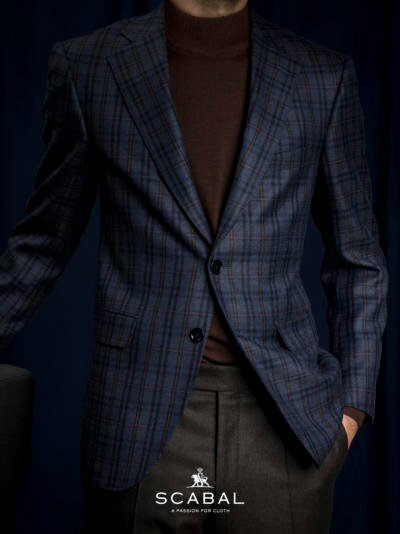 Would a 14/15 ounce Hardy Minnis flannel work, or would that suffer from the half-suit look? It would be Neapolitan make with patch pockets to minimize the suit jacket look. Alternatively, I was thinking of a 12/13 ounce W Bill tweed. Do you have any alternative suggestions? With those weights, for a Neapolitan style jacket, would it be ok to go down the unlined route? Or, if it’s a winter jacket, is it best to have the jacket lined? What about durability? Are lined jackets more durable than unlined? Interesting. It begs the question, why line a jacket? Is it purely an aesthetic feature? As always, thanks for the replies. Have a nice Christmas and New Year! Simon, it’s been interesting figuring out where I fit among your average readership in terms of formality, and I’m at the more casual end certainly, so I’m learning to temper your advice to suit my workplace. In putting together a range of odd jackets to wear in my creative field, where most of my colleagues dress ultra-casually, I think I might be better served by what you would steer the average office denizen away from initially, namely the more rustic browns, greens, tweeds, etc. I think even a Navy hopsack blazer would attract unwanted feelings of dressy-ness. Paired trousers would be denim, chinos, with flannels at the top of the scale. Shoes from white converse up to brown brogues. How would you rate, say, a glen check in brown (I covet the current one at Drake’s) over a donegal tweed, herringbone in cashmere or a non-navy hopsack on the formality scale? I think all of my choices need to work in outfits no higher than a 4/10 smart if I don’t want to stick out too much. Do the above sound in the right spectrum? Funny, I re-wrote my question about 5 times, sensing there was something incoherent about what I was trying to say. Evidently, so it remained! Thanks again. I am thinking of commissioning a single breasted summer jacket and am particularly fond of clothes with wool, silk and linen blend. I like the extra bit of texture from the silk and linen. However I have been struggling hard to find a suitable one as I find most fabric not to my preference due to their more very ‘opened’ weave. I particularly like a jacket Taka from Liverano wears(http://www.markcho.com/for-rake-japan/2015/8/19/takahiro-osaki), as seen from the picture taken by Mark Cho here though I am not quite sure if that is a wool silk linen blend. Whats your reccomendation for such a fabric? It looks like that blend to me, yes. 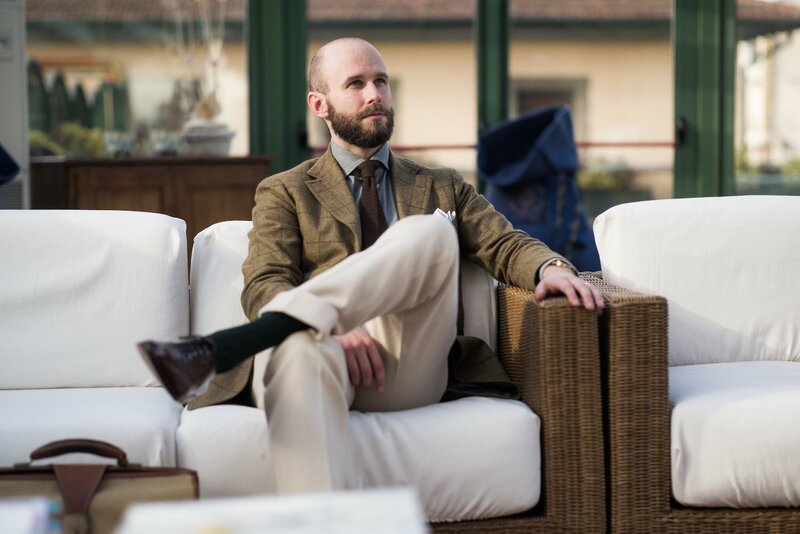 You need to peruse the summer jacketing books from the italians – Loro Piana, Drapers, Cacciopolli and so on. I was wondering what your thoughts are on using moleskin fabric for jackets. Any experience with Harrison’s Lamlana or Moonbeam? There’s mention of you using the Lamlana for your Hitchcock jacket but nothing about your thoughts on the cloth. I’m trying to avoid Cashmere as it’s not the most durable fabric. Would Lamlana be considerably more durable? For a navy standalone jacket, is there any particular pattern you favour? I’m thinking of using a navy herringbone fabric, link below. I assume it would work as a standalone jacket to be worn with plain grey trousers? Any particular shade of grey that you’d recommend to go with a navy blazer? The one in question is quite dark. I’m unsure whether a lighter shade or mid-grey would be better. I’m looking at some navy herringbone fabric for a jacket. One that has taken my eye looks to be a mixture of navy and black. Admittedly, you can only see the black when you look up close. Given that I mostly wear brown shoes, would this fabric be the wrong one to choose. It’s the black in the fabric that’s giving me doubts. If I wore black shoes, I wouldn’t see an issue. I wouldn’t worry about the black, if it’s that hard to see. Consider more whether the navy overall is just a little too dark to be versatile with those shoes and types of trousers etc. A dark navy is very useful, but will usually be best with dark shoes, including a dark brown. The below link shows the fabric. You can see the black. Do you still think that it will pair with dark brown shoes? Bamboo is being pushed this season by a number of tailors. Any thoughts on this. Presumably it creases too much for say Friday office wear ? I’ve never had anything made, but it does crease less – or has a roll to it rather than a sharp crease – than linen does. Depends on your office, but if you normally wear a worsted suit then yes probably. Hi Simon, what do you suggest to add to my winter wardrobe ? I definitely need a solid/plain sport coat. I’m thinking about herringbone brown (not too dark) maybe in cashmere. I don’t have to be formal day by day. I think I sit in the middle of your formality scale. You are experienced to give me a great advice. Yes no tweed. I’m thinking about cashmere or Escorial. I’ve seen a Escorial un-dyed bunch with a fantastic brown herringbone. Did you see it? A certain kind of brown could be an option because the tweed is mostly red, but I will consider also navy (given my suit is royal blue, i.e. light than navy). I saw your oatmeal cashmere jacket but I think it is too light for me. I hope you do not mind this delayed (and not very relevant) question. What cloth would you recommend for a winter dressing gown? I have been a reader of your website for a few years now, I really enjoy your content and have acquired some knowledge from your articles. I wanted to ask you a question regarding the number of cuff buttons a sport jacket should have, I read a post somewhere that a tweed sport jacket should only have one or two cuff buttons because anything else would be classically incorrect. Does this rule only apply to tweed jackets and sport jackets in different fabrics? As I have noticed other types of sport jackets can have three button cuffs or four button cuffs, such as the case with the hacking jacket, shooting jacket, and sport jackets. There is also the sack jackets which were part of the Ivy League look that have two button cuffs or a one button cuff. I was hoping you could clarify this with me as I have tried searching for websites addressing this topic but could not find any. Thank you. First off, I wouldn’t worry too much about what people says is classically incorrect or not. Generally, sports jackets have fewer buttons than suits, most commonly 3 in the UK, often 1 in Naples, but there is far from being a consistent rule. I would go for either 1 button or 3 buttons, depending on which style you prefer. Two is a little more unusual, but also fine. I’d probably avoid 4 just to differentiate it from a suit. Do tailors from Napoli generally prefer one button cuffs? And do any of your Napolitan sport jackets have three ? Probably on average, yes, for sports jackets. No, I don’t think any of mine do. Apologies for posting this comment here. I did not see any recommendation in the cloth guide for places where we can buy cloth (not necessarily “vintage” cloth)? I was looking for a good choice of tweeds. Are there any websites or bricks and mortar shops you recommend (especially in London)? Thank you Simon, that answers a lot for me and I will be sure to remember this useful piece of information. Since you mention which number of button cuffs is seen in specific countries, I think a 3 button or 1 button cuff is ideal for a sport jacket. I especially like a 2 button cuff in a sport jacket it is a detail Brooks Brothers used to offer in the Twentieth century and can sometimes be found in J.Press. Come to think of it, a four button cuff would make a sport jacket look similar to a suit. Curious to get your thoughts – I am considering a navy Crispaire suit and wondering if the jacket could work as my primary navy blazer as well. Given that Crispaire is a plain weave (though still a worsted wool), my thought is that it would make for a good, though smarter, navy blazer. However, I’m concerned the density and fineness of the worsted wool may make it difficult to pair with more casual cotton trousers. Any thoughts as a comparison to a more open-weave and less dense hopsack option? Thanks in advance! I can see why you and many others aspire to this, but I’m hesitant to recommend any cloth for it, as it rarely works. Even if a high-twist like Crispaire worked as a jacket (which I don’t think it would most of the time), it would be a very formal one and not really suited to casual cotton trousers. Sorry, but my advice would be to get a suit or a jacket, and not try to force both out of one commission. Nope, that’s exactly what I needed to hear. Much appreciated! Keeping in the same theme. Would a sharkin be suitable as a blazer? What style preferences might you mention to the tailor? Any interesting details that you like? 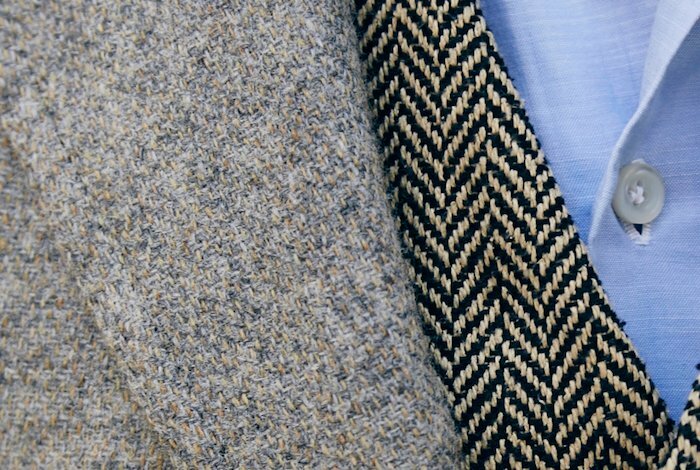 Double lapel buttonholes or other unique designs? Is a RAF sports coat comparable to a navy sports coat in terms of versatility and color matching? No, it’s much more limiting. What a shame! You looked more dashing than any movie star with your RAF suit on! It is a great look, but not very versatile I’m afraid. Hi Simon. Happy Holidays to you. For a first navy blazer, that I could wear 3 or 4 seasons, and could go with grey flannel trousers, what material should I choose? Cashmere? Hopsack? Would the W&S house style be good for this look? I am picking up a couple of suits from them next month, but not sure if I should use them for blazers/sports jackets. It depends what that fourth season is you might miss out… Hopsack wouldn’t be great for winter, cashmere not great for summer. A question specifically related to hopsack fabric for a Solito sportcoat commissioned to be worn in San Diego, California. Can you recommend a weight for such a fabric? I’d like the jacket to not be too light and flimsy, but rather a bit of heft so it drapes nicely without being overly hot to wear in nice weather. I’m guessing something in the 9/10 or 10/11 ounce range but I’m not sure if this would be ideal? Thanks for the question. If you want something with some heft and better drape, I’d suggest looking more around the 10/11 ounce area. Hopsack will have that line and drape better than most other things around the same weight, but more weight will always help. Eleven ounces should be good.